The area of the Bay of Cadiz, nerve centre of the Cadiz Costa de la Luz, where the Hotel La Catedral can be found, is, undoubtedly, one of the most attractive tourist destinations in the country, thanks to its many natural resources: flora and fauna, culture, social events, sports, gastronomy... which each year attracts more tourists and visitors who decide to stay and extend their visit to be able to experience the wonderful opportunities offered by this spectacular spot and its surroundings. 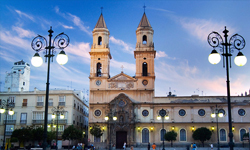 Denominada Known as the "Silver Cup",, full of history, of charm, and of attractions to visit, Cadiz is the home of the 1812 Constitution. This piece of land, seized from the sea, is also famous for its Carnival, its abundance of monuments, its splendid city beaches with their fine sand, and of course, for the irresistible taste of its gastronomy. The "Silver Cup" is considered to be the oldest city in the Western world. It was founded by the Phoenicians, a seafaring people that made Gadir an important commercial centre which was subsequently settled by Carthaginians, Romans, Visigoths and Muslims. A cosmopolitan and open metropolis, Columbus chose its port as the place to start his second voyage to the New World. After the decline of the port of Seville, the city became a port to the Indies, bringing together the flow of commerce with America. Although the plans were drawn up by the architect Acero, and the first stone was laid in 1722, the building work was supervised by various different architects due to it being continuously brought to a halt. This meant that during these breaks in the building work, the different chapels were used for other things, workshops, storage, mortuary, etc. It was after a fire in the San Firmo Chapel that it was finally finished. It was consecrated by the Bishop Friar Domingo de Silos Moreno in June de 1838. It was started in a baroque style, ground floor and start of the walls, and finished in the neoclassic style, exterior and interior. The fittings are of an eclectic style. We can highlight the different chapels and the crypt, partly excavated in the rock under the main altar. 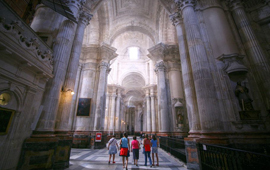 Inside the cathedral you can visit the Poniente Tower. This is one of the twin towers of the cathedral, precisely the one that is next to the street Arquitecto Acero. Visits offer the highest and most impressive views of the city as it is the highest point of Cadiz at 74 metros high. Guided tours are every 30 minutes in English, French, German, Italian and Spanish. Free entrance: Tuesday to Friday 19.00 h. to 20.00 h. / Sunday 11.30 h. to 13.00 h.
Mass: Sunday 12.00 h. / Bank holidays 10.00 h. to 14.00 h.
Monday to Saturday 10.00 h. to 18.30 h. / Sunday 13.30 to 18.30 h.
The most important example of the integration of archaeological remains in the urban landscape of the city of Cadiz is the Roman Theatre, discovered in the Populo neighbourhood in 1980. Its dimensions meant that a series of buildings had to be expropriated in order to carry out archaeological excavations and recover part of it. After a long process of restoration and remodelling, the building is currently perfectly set up for visits. 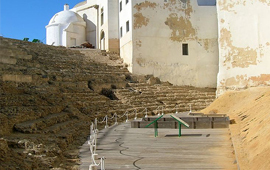 The origin of the construction of the Cadiz Roman Theatre can be placed, thanks to classical sources, in the middle of the 1st Century B.C. although data obtained during the excavations carried out show that it was completely refurbished under Augustus. The built area takes up an important part of what is now the Populo neighbourhood, corresponding to the fortress of the medieval city. On top of its walls are part of the ecclesiastical buildings next to the Santa Cruz church (Old Cathedral), Estopiñán House, Posada del Mesón and Municipal Nursery, where the castle or citadel could be found until the last century. The excavations carried out until now only allow us to know the approximate diameter of the cavea or stands, a semi-circular area for spectators, and which is roughly 120 m. The excavated part of it corresponds to its central section and is made of typical Roman concrete, made of a mixture of rubble and lime with a plastered surface, resting on natural sloping ground. At the top are the remains of a highly curved wall, damaged by successive reforms, which could be part of the facade of the theatre. Another important sector excavated is a wide section of the passageway through which spectators accessed the middle part of the stands. It is generously sized and covered by a semi-circular annular vault. The same as on the outside, the most-used material is concrete. All of these structures can be visited in the excavated are, together with the Cathedrals of Cadiz, in the Populo neighbourhood. The province boasts 260 kilometres of coast and 138 kilometres of beaches: coves, inlets, and kilometres of sands. There are historical beaches like that of Trafalgar, opposite which the famous battle occurred and beaches featured in films like the Caleta beach where scenes were filmed from James Bond. There are beaches like the Victoria beach, one of the first in Europe to obtain the EU environmental management certification and colourful beaches like those in Tarifa, full of kite-surfers and their brightly-coloured kites. Beaches that are ideal for windsurfing; and diving with many initiates enjoying the transparent waters of their numerous beaches: Los Lances, Bolonia, and Valdevaqueros among others. In total, 83 different playas. The cliffs of Caños de Meca (Barbate) and the coves of Conil must not be missed. 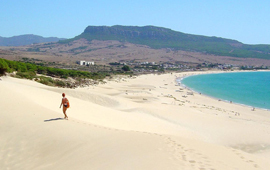 On some we can find natural monuments such as the sand dunes on the beach at Bolonia or the fishing weirs in Rota. In Cadiz, the sea often meets the mountain with landscapes of pine forests, woods and salt marshes. Punta Candor in Rota and the Castillo beach in San Fernando are wild beaches, but each in its own way: in one there are rock masses and others can only be reached on foot or swimming.